How Pop Culture Replaced the Prophet. Maybe God doesn’t speak through prophets as often these days because he knows people wouldn’t listen. Maybe God speaks to us in different ways—and in the places he knows where we congregate: in our movie theaters, living rooms, iPods, and smartphones. Maybe God still longs to connect with us, and so goes into the places where we’re most likely to listen. Burning Bush 2.0 is a whimsical and sincere examination of the ways God communicates with us—sometimes subtly and secretly—through our media and entertainment streams. Asay examines how faith and God’s fingerprints mark movies and music, television and technology. Through word and picture, God still speaks to us through unsuspecting voices—in ways we’re best able to hear—even if we don’t fully comprehend it completely in the moment. God is everywhere, and doesn’t ask permission to speak, shout out, or whisper his name. Includes study guide for individuals and church groups. 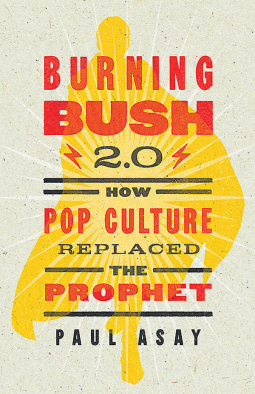 In Burning Bush 2.0 the reader is introduced to the idea that God speaks to us through the mainstream media of today. That His voice whispers truths to us through largely secular movies and television shows. That there are spiritual lessons we can learn from zombies!? Chapter 5, the one about the zombies, lost me a little and I didn't really understand the point that Asay was trying to make. But by Chapter 9 he had gotten himself back on track somewhat and was making some kind of sense to me again (although he still wasn't saying how God speaks through the subject matter of what he was writing about - just how the Christians involved were holding to their faith while operating within a secular climate (not producing for the Christian "market"). I think the most important point that Asay is trying to make in Burning Bush 2.0 is that we can see the fingerprint of God almost everywhere if we choose to look. I say almost, because there are some places where God is very obviously not evident. Are there lessons to be learned through popular culture? Yes, definitely - in some of it. Is it God speaking through popular culture to the world at large ... I'll leave that to you to decide.